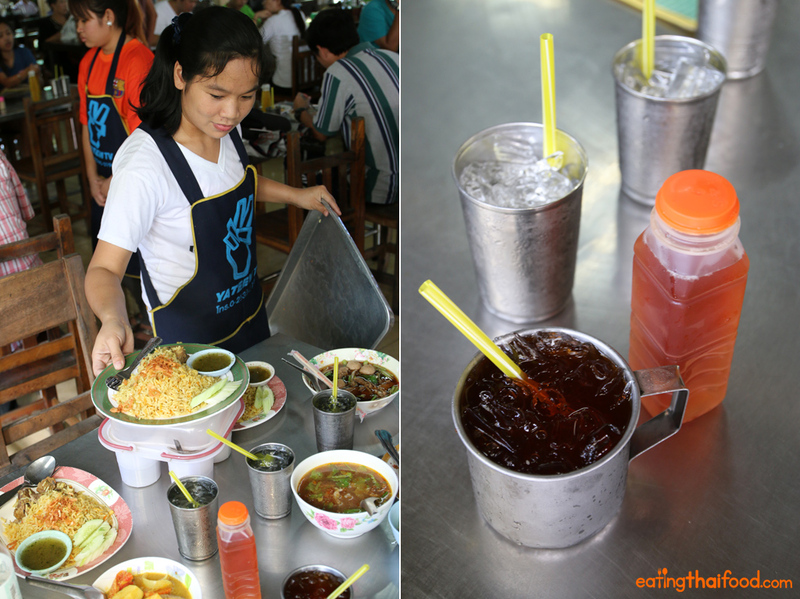 My mouth is beginning to water even as I write this post about Yusup Pochana (ยูซุปโภชนา). You better believe it… the food was that good! 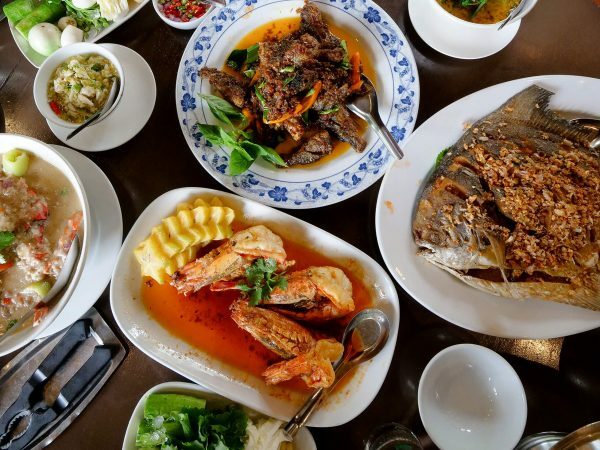 This famous northern Bangkok Thai Muslim restaurant will serve you a meal you won’t forget, and a few of their dishes left me in tears of joy. About to start digging in! The restaurant is in sort of a big garage like dining room, with big iron rafters covered in cobwebs and shiny metal tables and chairs. After checking out the menu, I’m not ashamed to admit we went a little crazy by ordering all out – mostly because I was so excited to try everything! They have a few different house-made juices available which were sweet and refreshing. All good Thai Muslim meals should begin with a roti mataba, a kind of stuffed roti that’s fried in lots of oil. I ordered the mataba pla (มะตะบะปลา), a roti stuffed with a mixture of fish, egg, and spices. It was served with a sweet and sour vinegar filled with red onions, chilies, and cucumber. This mataba was one of the best I’ve had so far in Thailand. 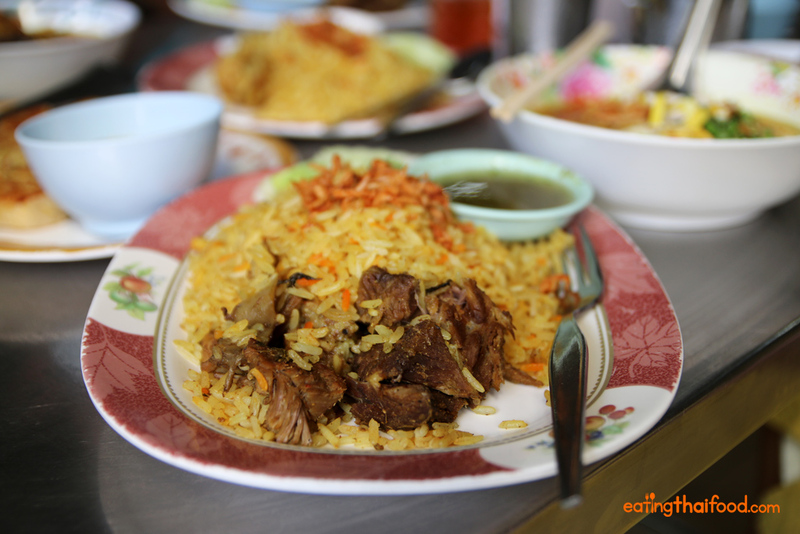 Khao mok, or Thai style biryani, is one of the classic Thai Muslim dishes, and at Yusup Pochana (ยูซุปโภชนา) they have their recipes down to perfection. I used to think the version over at Aisa Rote Dee was good, but I’ve got to say, all three of the plates I had here were multiple times better. Khao mok neua (biryani with beef ข้าวหมกเนื้อ) came as a gigantic chunk of boneless and tender beef, sunken below a pile of rice that was topped with fragrant fried shallots. The sauce was also perfect, just the right sourness and spiced with mint. Goat is not always available in Bangkok, so when I see it on the menu, I go for it. At Yusup Pochana (ยูซุปโภชนา) they only make goat dishes on Tuesday, Saturday, and Sunday – so if you’re looking for a dose of this good stuff, come on one of these days. 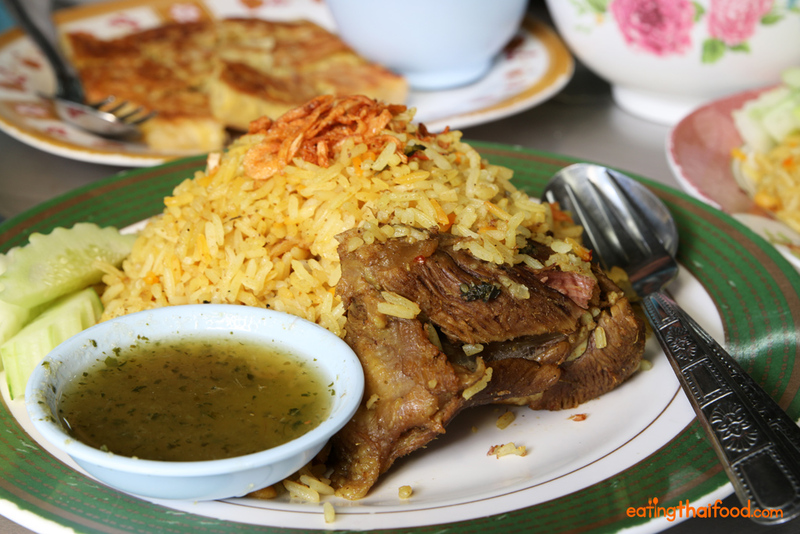 The khao mok peh (biryani with goat ข้าวหมกแพะ) was also amazing, the goat was extremely tender. Due to supply and demand, the goat version was quite a bit more expensive than the beef or chicken. 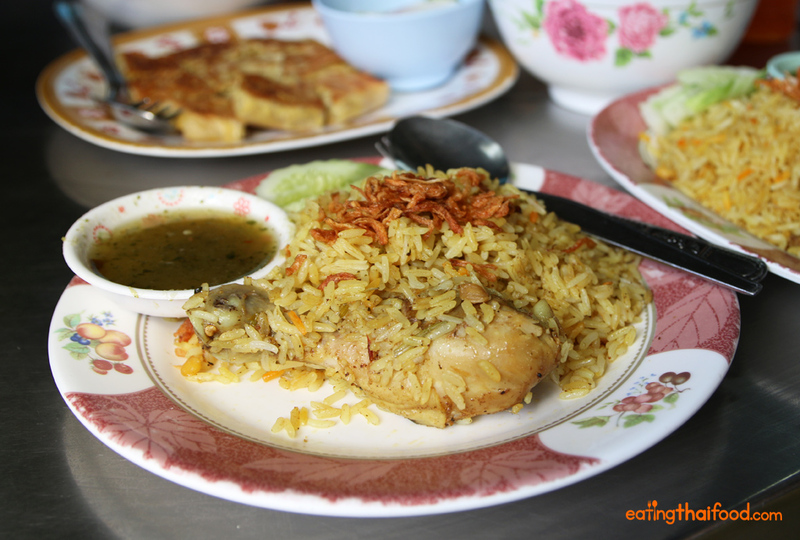 Finally the khao mok gai (biryani with chicken ข้าวหมกไก่), the cheapest version of all of them, included the same glorious rice with a meaty drumstick on the side. Excellent again, but my vote was for the red meat versions. Everything I ate at Yusup Pochana (ยูซุปโภชนา) was incredible, but the kuay teow kaeng gai (ก๋วยเตี๋ยวแกงไก่) wasn’t my favorite of the meal. The rice noodles were beneath a creamy rich coconut curry and layered with all sorts of goodies. The curry sauce was a little on the sweet side for my taste, but I’d still recommend it. However… I was a little more occupied by my goat curry (see below). 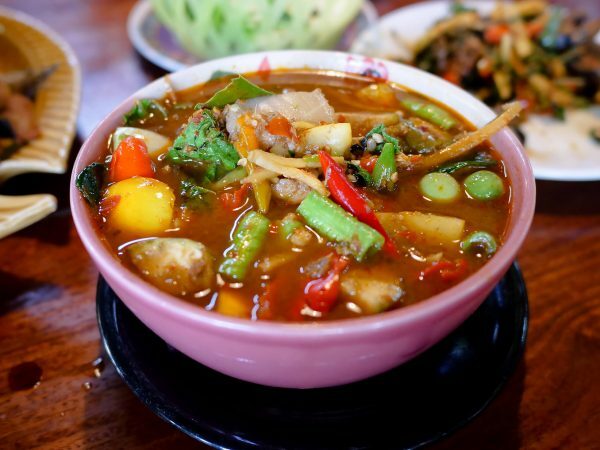 One of the real bonuses I love about eating at Thai Muslim Halal restaurants is that beef is available, and I nearly always order the soup neua (ซุปเนื้อ), or just beef soup. The broth was sour and spicy, with a tinge of tomato, lots of garlic and onions, lime juice to make it sour, and big meaty cubes of fall apart tender beef. 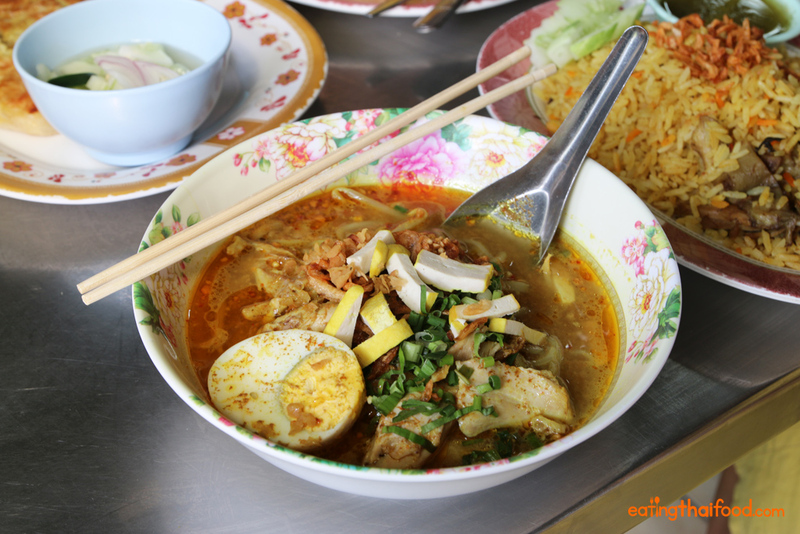 You don’t always need noodles in noodle soup, sometimes you just want all the goodies that comes with the noodle soup, and that’s when you order kow lao neua (เกาเหลาเนื้อเปื้อย). Again, it was packed with luscious beef broth, chunks of beef, and beef meatballs. 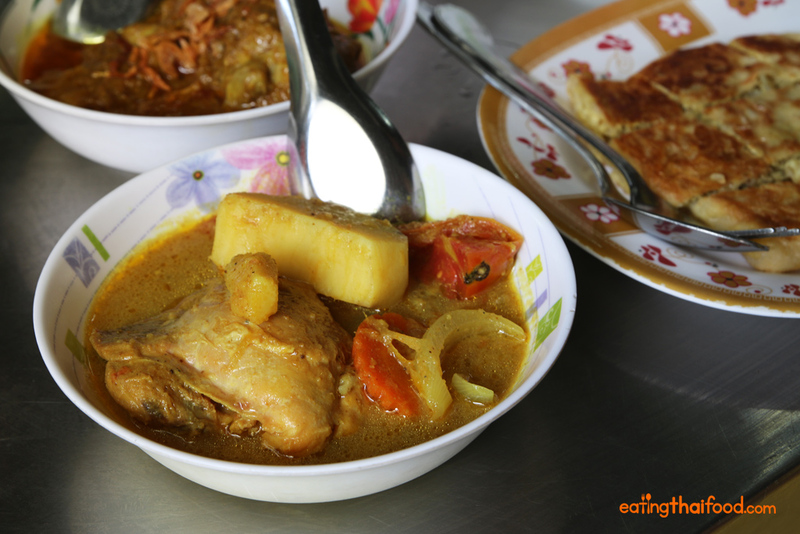 Kaeng kari gai (กะหรี่ไก่), is a Thai curry flavored with curry powder and turmeric and thickened with creamy coconut milk. Their version was mild yet had a real comforting taste to it. 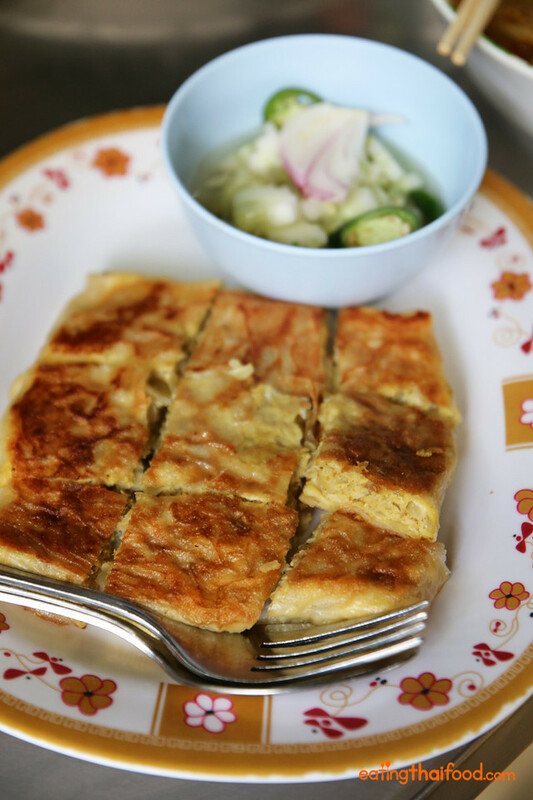 Kuruma peh (กุรุหม่าแพะ) – One of the best dishes I’ve ever had… seriously! Alright, finally the moment you’ve been waiting for… on to the ultimate dish of the meal, and what I can safely say was one of the best dishes I’ve ever tasted in my entire life – for real! 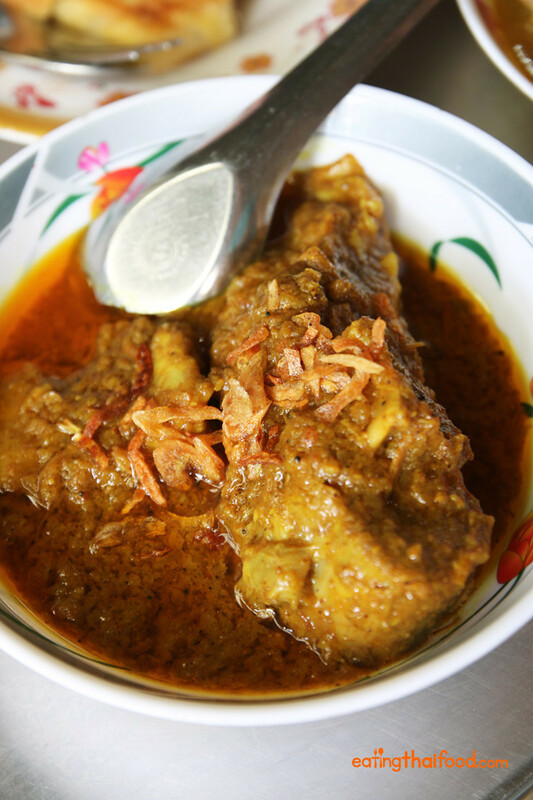 This piece of goat, known as kuruma peh (กุรุหม่าแพะ) on their menu, is a complex Muslim Thai dish that includes a mix of flavors and spices from India, Myanmar, and Thailand. Note: Only available on Saturday and Sunday. Cinnamon, cumin, turmeric, and garam masala all in a rich oily curry sauce saturated the meat, which was so tender it just flaked apart with a chew from my lips (not even my teeth). The flavor was outrageously good, one of those dishes where all you can do is chew and close your eyes, hardly unable to believe the level of delicious. 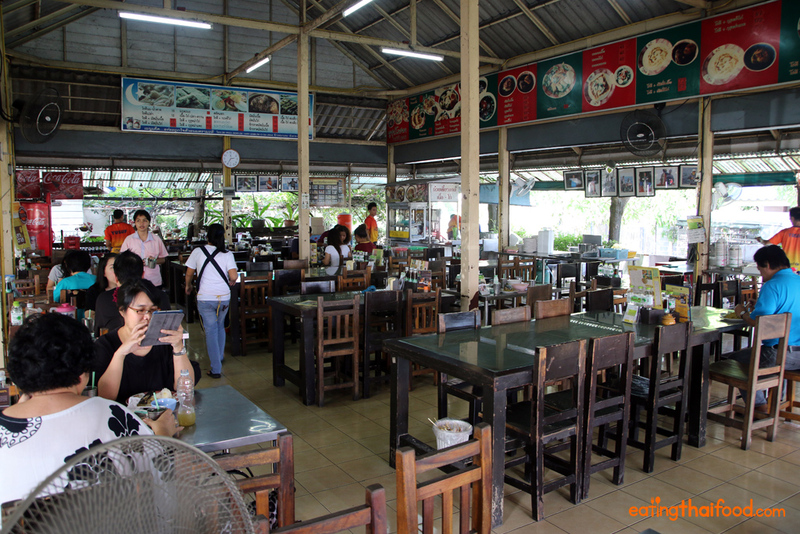 Yusup Pochana (ยูซุปโภชนา) – A restaurant you’ll love! I really have nothing else to say other than the food at Yusup Pochana (ยูซุปโภชนา) is insanely delicious. You will not ever regret eating here. NOTE: Goat is only available on Tuesday, Saturday, and Sunday and the Kuruma Peh is only available on Saturday and Sunday. There’s no real easy way to get to Yusup Pochana (ยูซุปโภชนา) other than taking a taxi or personal vehicle. If you go by taxi, it’s sometimes even hard, so I would recommend printing off the address and name of the restaurant to show the driver. 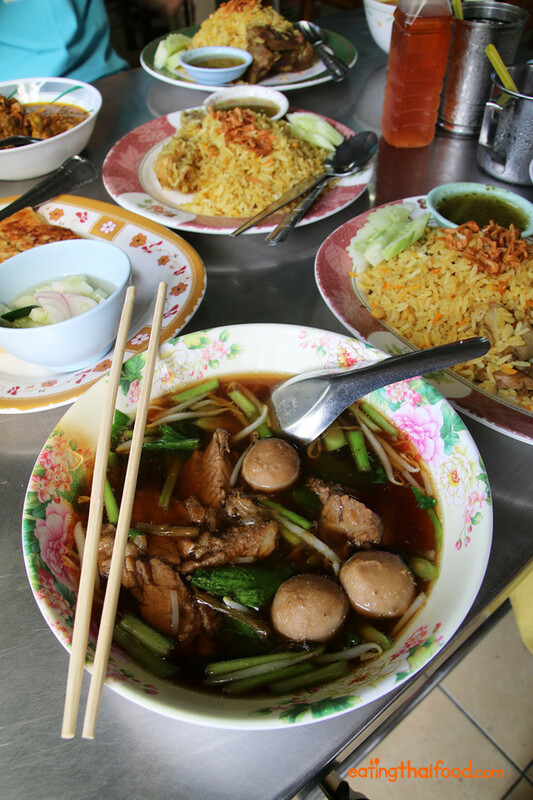 The restaurant is located on the side of Prasert Manukitch Road, in the northern part of Bangkok, about 10 or 15 minutes north of Chatuchak. Note: There are 2 restaurants next to each other, make sure you veer right on the little bridge. This place has dropped in quality. miserable staff, cold food that lacks flavour. Not what you would expect in Bangkok. I am afraid your review is a little dated. possibly the business has changed chef’s. Hi Mark, do you know if this is still open? does anyone know whether the place is still open / has the same business hours? Hi Mark, This place looks amazing. Did you ever confirm if there was another location? If so is it easier to get to? Hi Marie-Joe, thank you very much. I’m still not sure, but hope you can make it out here, it’s well worth it! I went there this morning, I took the BTS skytrain to Mo Chit then hopped in a meter cab going North on Pahonyothin rd., I called the restaurant and handed my phone to the taxi driver for directions. The spot marked on the map is incorrect by a bit, it’s closer to Prasert-Manukitch 25 alley. The easiest way to find it is once you are on Prasert-Manukitch Rd. Look for the cement pylons running down the center of the road, they are numbered, the restaurant is directly across from #97. The Karuma Peh was delicious!! Rich, flavorful, and well spiced. It was a good sized portion and I had it with steamed rice but when I was done I debated ordering a second one. Instead I ordered a Roti Mataba Pla, and I’m really glad I did!! It was the best Mataba I’ve ever had, I was not aware that a Mataba could be that good. 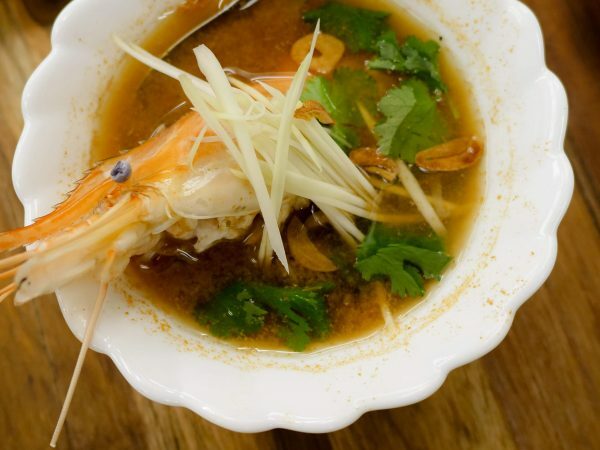 Rich, savory, eggy, onion flavor with a hint of light fresh fish….WOW. My meter taxi was about 100 baht there and 120 baht back to the BTS. It was actually very easy. Next time I’ll try the bus. Thanks Mark!! Hi Rakhal, very cool to hear you enjoyed this restaurant and the kuruma peh. Mmm, hearing your description is making me really hungry right now. Thanks for the extra directions help as well! This is a great restaurant, certainly one of my favorite in Bangkok, and Mark’s enthusiasm is fully justified. For what it’s worth, Austin Bush is also a big fan – I first learned of Yusup from his blog in 2008. So please don’t be dissuaded by the negative comment above. A couple of notes to add to Mark’s review. First, one of the best things about Yusup is the roti, which Mark appears not to have tried. All of the curries can be ordered with roti accompaniment, and this is highly recommended. They also have dessert roti, which is doused with sweetened condensed milk and sugar. If you have a sweet tooth, you absolutely must try it. The other dish I would recommend is the massaman curry. Chances are, you’ve come across massaman before, but I’d wager that Yusup’s version is richer and more flavorful than any you have tried. In general, I would recommend skipping the soup dishes in favor of ordering more curries or khao mok. 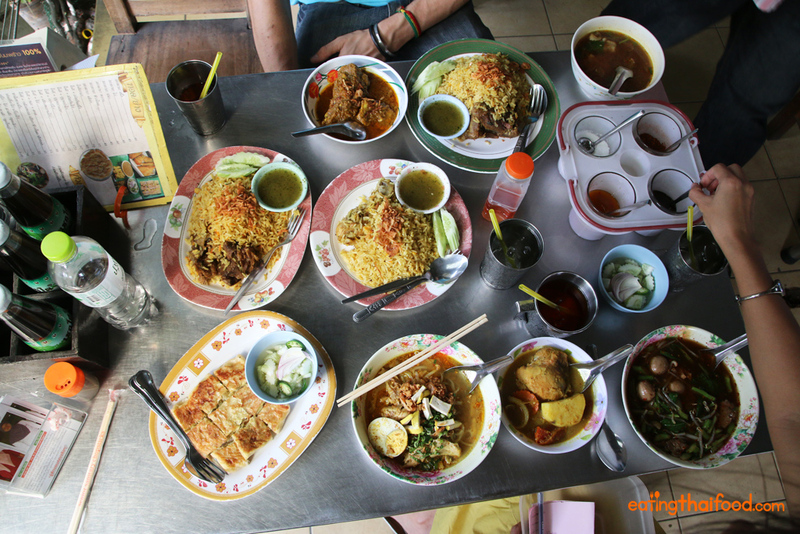 The soups are perfectly tasty, but the curries, roti and khao mok are truly special. If you can, go early. I prefer to treat it as brunch and head there in the morning. The earlier you go, the more likely the roti will have been just made, which makes a big difference, especially for the dessert version. Finally, note that Prasert Manukitch (or Prasoet Manukit) Road and Kaset-Nawamin Road are two names for the same highway (aka Thailand Route 351). I was confused by Mark’s reference to Prasert Manukitch because I’ve always known it as Kaset-Nawamin. Wikipedia set me straight. Hey Sean, great to hear from you, thank you for all the extra information. Glad to hear that you love Yusup. 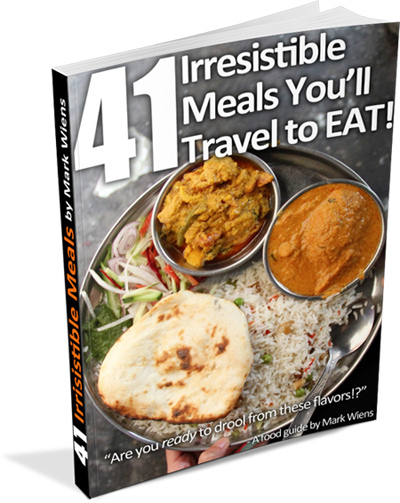 Next time I go, I’ll for sure be ordering some roti and massaman – sounds wonderful. Hey Thicha, thanks for watching. Hope you can visit this restaurant, the food is great. We just (literally) made the journey to Yusups after a morning at Chatachuk market and I have to say it was absolutely not worth the half hour taxi rude. We attempted to order the Beef Biryani and Kuruma peh as recommended. They were out of the beef Biryani so we settled for a cold plate of sloppy looking Chicken Biryani instead. It was not only cold but rather flavourless. 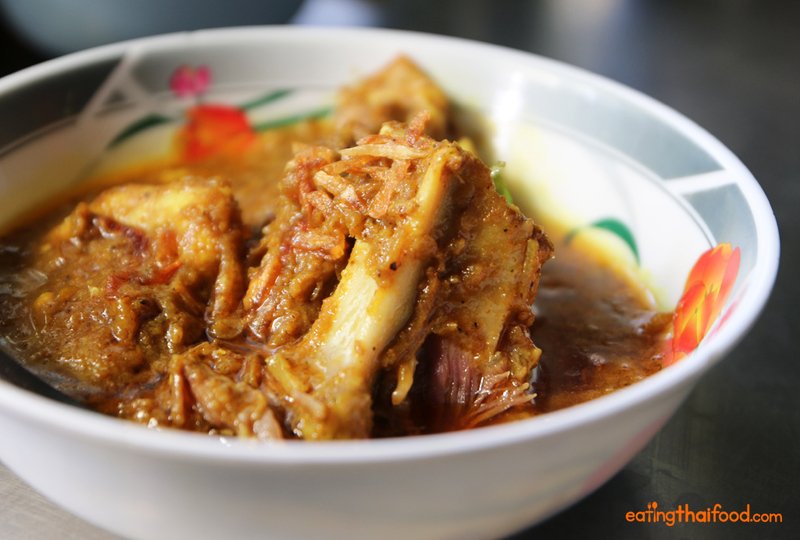 Next, we sat in anticipation for the much talked about Kuruma peh with roti but alas that turned out to be a cold lump of overcooked meat in sauce. My husband and I quickly scarfed down what we could, thanked the extremely friendly owner and left to wait at the side of the highway for a long taxi back to Sukhumvit. For those of you thinking to take the treck spare yourselves. There are a thousand better Indian restaurants in Thailand. I reckon picking a random once out of a hat or wandering into one close to your hotel would get you a better meal! Very sorry to hear that Maria. My experience eating at Yusup has been nothing short of extraordinary. Shame on me again, even Thais like me never know such restaurant before. After a few google, I find out that there is second branch of Yusuf Pochana. The second branch locate on Kingkaew-Suvarnabhumi road. Great to hear that Kitti, didn’t know there was a second branch. Did you eat there yet!? Not yet, but I’m going to try at the first branch when I go to JJ Market. Yes it looks amazing. I want to go with you next time!! Noooo! My mouth was wide open there then I read 10 or 15 minutes north of Chatuchak. Khao Mok Kai is often my to-go-to dish at food courts because it’s hard to find elsewhere but the quality here looks tenfold. Bangkok needs more of this. I only ever found one decent street food version wheeling round Sampaeng. Everything here looks amazing…10 minutes isn’t that far I guess, still tempted. Allan, you should make the trip, just jump in a taxi, it’s well worth it. This places goes down as one of my favorites!